MPC's Metalphoto® Rigid Tags are .020” anodized aluminum face stock (optional thicknesses from .008” to .063”), with a high-performance permanent pressure-sensitive adhesive. Black or silver images are sealed beneath a sapphire-hard anodic layer for superior resistance against abrasion. 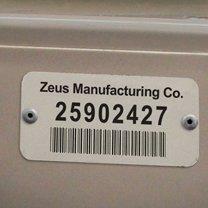 Why choose MPC’s Rigid Asset Tags? Thicker aluminum provides greater impact resistance. High-performance permanent adhesive and/or holes for mechanical attachment. Superior resistance against UV, abrasion, chemicals, corrosion and extreme temperatures. Crisp graphics on a black or silver metal background. Photosensitive anodized aluminum face stock in .020” (Optional thicknesses from .008” to .063”). All common symbologies available, including 3 of 9, I2 of 5, 128, Data matrix and QR codes. Color options available. Note: Colors have limited UV resistance. Not recommended for long-term outdoor use. Wide selection of standard sizes; custom sizes also available. Shipped in sequential order, in boxes. 100% no missing numbers. 10-15 working days from receipt of order and approval of artwork. Expedited shipment is available for an additional charge.